Galaxy clusters, like the universe as a whole, are composed of both baryonic (“ordinary”) matter and dark matter, with about 1 part in 6 of the former, and five parts in 6 of the latter. A curious thing happens – usually – when two clusters collide. Both the visible baryonic matter, consisting mainly of luminous galaxies, and the dark matter, continue on their way after the collision. They show almost no signs of the encounter, although they may be fated, ultimately, to merge. However, there appears to be substantial interaction of the intergalactic gas that existed before the encounter in both clusters. As a result, the gas loses most of its momentum and is left behind, between the two departing clusters, after the collision. This gas is very hot, and is easily detected at X-ray wavelengths. The best known example of this phenomenon is the Bullet Cluster, about which research was reported in 2006. (News articles: here, here, here, here; Research: here). 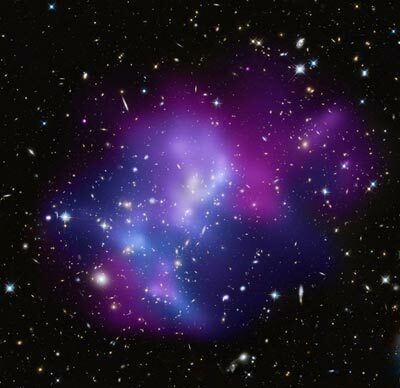 Yet now there is confirmation of a galaxy cluster collision – Abell 520 (A520) – in which a large quantity of dark matter appears to have been left behind. This is surprising, since the main reason given to explain why this should not happen is that dark matter is expected to interact very little with itself. The magnitude of this interaction is expressed as the ratio of the interaction “cross section” to mass. In the Bullet Cluster, the upper limit for this was found to be at most 1 cm2g-1. But in A520 this same measure is estimated at ~3.8 cm2g-1. 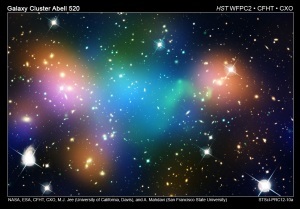 A520 seems to be the exceptional case, rather than the the Bullet Cluster, since results similar to the latter have been found in other cluster collisions, such as MACS J0025.4-1222 (News article: here; Research: here), Abell 2744 (News article: here; Research: here), and DLSCL J0916.2+2951. Simulations of galaxy formation based on the Lambda-Cold Dark Matter (ΛCDM) cosmological model predict that a large galaxy such as the Milky Way should have many dwarf satellite galaxies, perhaps thousands. However, only about 20 or 30 have been identified. Where are the rest? Are they really there? That question alludes to the “dwarf galaxy problem“. Astrophysicists suspect that most satellite galaxies are much smaller than the galaxies they orbit. And, in addition, such dwarf galaxies may consist mainly of dark matter, with few visible stars, so they should be very difficult to detect, even if there are a lot of them. Since dwarf galaxies consisting mainly of dark matter are so difficult to find by visible light, there could be enough of them to reconcile the large number of dwarf galaxies that simulations predict to exist with the small number actually observed. Surprisingly, recent research (Vegetti, et al) has been able to detect a very distant dwarf satellite galaxy by gravitational lensing effects – and from that it is possible to infer that a large number should exist. The image shows an Einstein ring, which consists of a foreground galaxy (JVAS B1938+666) in the middle, and the distorted image of a more distant galaxy making up most of the ring. A detailed mathematical analysis of the image has confirmed that a minor irregularity in the ring is caused by the presence of a dwarf satellite galaxy of the lens galaxy. Although there is very good indirect evidence for the existence of dark matter, it’s an understatement to say that actual detection of dark matter particles has not been easy. Recent research results from two different teams that both studied gamma rays from dwarf galaxy neighbors of the Milky Way provide an illustration of the difficulty. Both studies are based on the hypothesis that dark matter consists largely of “WIMPs” (Weakly Interacting Massive Particles). If existing indirect evidence for dark matter can be explained by modifications to the theory of gravity (so dark matter doesn’t actually exist), or if it exists in some form other than WIMPs, then the results of these studies are consistent with either possibility, but otherwise provide no additional information. A further assumption of the WIMP hypothesis is that WIMPs are Majorana fermions. This is true, at least, if WIMPs are supersymmetric neutralinos. What this means is that WIMPs are their own antiparticles, and hence they are annihilated in any collision with another of their kind. This annihilation can occur in different ways or “channels”, in which different types of known antiparticle pairs are created, such as b and anti-b mesons or τ+/τ– leptons. These particles subsequently decay and produce gamma rays, which the Fermi Gamma-ray Space Telescope is designed to detect. The latest research shows that gamma-ray emissions that can be detected, from 7 to 10 dwarf satellite galaxies of the Milky Way, are not significantly higher than expected background emissions. Consequently, if indeed dark matter consists of WIMPs, then the individual particles must have masses above some lower bounds. The Bolshoi (Большой) supercomputer simulation is a simulation of a substantial portion (a cube one billion light-years on a side) of the entire universe. Of course, any simulation is limited in the level of detail (the resolution) it can handle, which depends on the computing power used to run the model. A simulation also relies on the most accurately measured values available of a number of parameters. This new Bolshoi simulation has almost ten times the resolution of the best previous simulation. It also uses an updated set of parameters, replacing the previous set, which wasn’t as accurate. 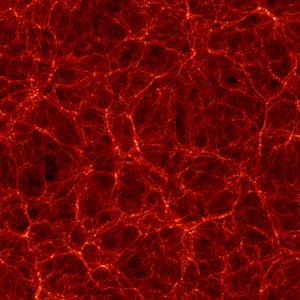 The Bolshoi supercomputer simulation, the most accurate and detailed large cosmological simulation run to date, gives physicists and astronomers a powerful new tool for understanding such cosmic mysteries as galaxy formation, dark matter, and dark energy. The simulation traces the evolution of the large-scale structure of the universe, including the evolution and distribution of the dark matter halos in which galaxies coalesced and grew. Initial studies show good agreement between the simulation’s predictions and astronomers’ observations. So what does a sophisticated simulation of this kind actually tell us about the history of the universe, including parts we can’t observe directly? The theory of relativity – both special relativity and general relativity – has now been tested successfully so many ways ever since its early days that further tests seem almost redundant. (That little mix-up with superluminal neutrinos to the contrary notwithstanding – since it’s at most a higher order correction, but more likely an error in data interpretation.) But science never stops testing if there’s some creative new way to do so. And that’s what’s involved here. One of the predictions of general relativity is that light photons lose energy when climbing out of a strong gravitational field. In that case, the light should be redshifted, in a way that doesn’t involve either a Doppler effect or the expansion of the universe. It takes a very strong gravitational field to make this gravitational redshift apparent. Even a single galaxy isn’t large enough. But a cluster of galaxies will do, although the effect is almost masked by relative motion of galaxies in the cluster. However, in a cluster there’s a fairly straightforward way to check, since the shift should be larger with photons from the center of the cluster than from the periphery, as the gravitational field is stronger at the center. Wojtak and his colleagues knew that measuring gravitational redshifting within a single galaxy cluster would be difficult because the effect is very small and needs to be teased apart from the redshifting caused by the orbital velocity of individual galaxies within the cluster and the redshifting caused by the expansion of the universe. The researchers approached the problem by averaging data collected from 8000 galaxy clusters by the Sloan Digital Sky Survey. The hope was to detect gravitational redshift “by studying the properties of the redshift distribution of galaxies in clusters rather than by looking at redshifts of individual galaxies separately,” Wojtak explains. Sure enough, the researchers found that the light from the clusters was redshifted in proportion to the distance from the center of the cluster, as predicted by general relativity. “We could measure small differences in the redshift of the galaxies and see that the light from galaxies in the middle of a cluster had to ‘crawl’ out through the gravitational field, while it was easier for the light from the outlying galaxies to emerge,” Wojtak says. In addition to further confirming relativity, this research may also rule out some alternative theories of gravity that have been proposed to avoid the hypotheses of dark matter and dark energy, which are needed with standard relativity to explain many astronomical observations – and do so very well. Particle physics: The dark at the end of the tunnel? Dark matter is certainly nothing if not elusive. If dark matter does not exist in some form or other, there are serious problems with much of what astrophysicists think they know about the evolution of the universe. There are numerous types of astrophysical observations which can be explained by the existence of dark matter. But these explanations are contingent upon both the existence of dark matter in the form of some sort of as yet unknown particles (“WIMPs“) and also the correctness of accepted fundamental laws of physics – such as Newtonian gravity. If dark matter doesn’t exist, then the fundamental laws are also called into question. To identify dark matter, experiments like DAMA, CRESST and CoGeNT look for weak-force-mediated collisions between atoms on Earth and WIMPs in the dark-matter halo of the Earth’s home galaxy, the Milky Way. Such collisions should cause individual atomic nuclei to recoil, and with the right apparatus such recoils can be observed. To screen out the confounding effects of cosmic rays, though, such experiments are best located underground. This sort of study attempts to detect actual dark matter particles as they pass by. Such experiments are increasingly sensitive, and seem to be showing “hints” of dark matter. The astrophysical evidence for dark matter is more extensive and diverse, but tells less about what dark matter actually is. A third experiment has detected tantalising signs of dark matter. The finding raises more questions than answers, however, as two other experiments have found no sign of the mysterious stuff, which is thought to create the gravity that holds spinning galaxies together, accounting for about 85 per cent of all matter in the universe.